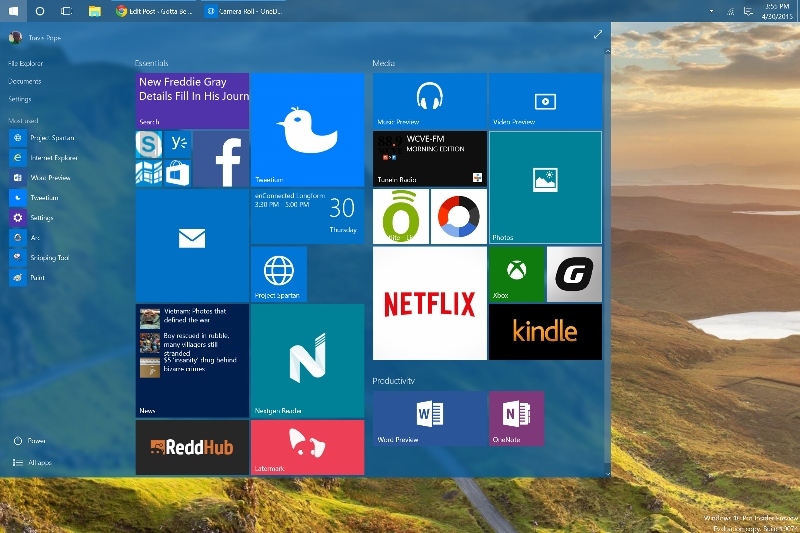 Windows 10 is Microsoft’s second big chance in more ways than one. Many see it as the company’s last opportunity to correctly balance the needs of notebook and desktop users with tablet users. Many others are hoping that this will be the operating system that perfectly encapsulates all of Microsoft’s different services and extras. One thing is for sure, Windows 10 includes a huge slate of new apps and major upgrades, Outlook Mail is one of these. Shortened to just Mail, Outlook Mail in Windows 10 looks different and feels different any app included in Windows 8.1. There are features stuffed into every area. There’s multiple account support and built-in ways of managing some of the settings you used to have to venture to Outlook.com for. What’s more, Outlook Mail in Windows 10 properly supports just about every major email service you can think of. Yahoo!, Outlook, Gmail, Office 365 and web mail accounts are all compatible with the app. Here’s how to add email accounts to Mail in Windows 10, and what you need to know about using the new Outlook Mail app as your only place for email. If you’re on a notebook or desktop press the Windows button to go to the Start Menu. Windows 10 tablet and touch users should press the Windows button on their device or the Windows button in the bottom-right corner of their screen to open the Start Screen. Now select the Mail app. By default it’s pinned to your screen, but it may be missing if you performed a Windows 10 upgrade and didn’t use the app before. Keyboard and tablet users should both press the All Apps button in the bottom-right area of the Start Screen and Start Menu to see a list of every app they have installed on their machine. Tap or click on Mail in the list of installed apps. If this is your first time opening Mail in Windows 10 you’ll get a nice walk through of its features and a button that lets you add an email account by default. You can follow the prompts and set-up your email accounts with this pretty quickly. The situation is more nuanced if you’ve been in the Mail app before, but didn’t add an account. You’ll get a view similar to what’s above. Tap or click on the cog on the bottom-left of the Mail app. Now click or tap on Accounts. Listed in the app under Accounts already should be your Microsoft Account. If you wish to add more email accounts click or tap on the Add Account button at the bottom of the list. Tap on the kind of email account you have inside the pop-up window. For this example we’re using Gmail. Go ahead and enter your email address and password information. You may have to input a code if you’ve setup some advanced security on your account. Now click Done and the email account you added should be available inside Outlook Mail. To switch to multiple accounts tap or click on the arrow next to the account you have open in the left pane of your screen. You can skip all the switching and go directly to specific email accounts by pinning an account to your screen. Right click or each account and select Pin if you’d like to do that. Touch users should hold their finger down on the account name and tap Pin to do the same thing. Know that any email accounts added to Outlook Mail in Windows 10 will carry over to other PCs equipped with Windows 10. It’s also important to know that Outlook Mail and Outlook Calendar work in tandem. If your account is present in Outlook Mail than your appoints are automatically added to Outlook Calendar. There’s no way to have an account available in one and not the other. Good luck with Windows 10 and setting up your email accounts. Microsoft says it plans to add more features and fixes to Mail on an ongoing basis. If you’ve deleted Mail you can reinstall it from Microsoft’s Windows Store along with Outlook Calendar. But is it easier to back up than Windows 8/8.1 Mail, which is a convoluted nightmare process ???? Here we are on 29 July, the official release is out, and I can’t add some accounts to mail. When it first launched and picked up all my existing accounts I ended up with 2 of everything, and they all had warnings telling me my settings were bad, so I had to constantly enter my password. The weird thing was that I had all my mail and it seemed to be fully up to date. My mistake was removing all the accounts, rather than just one of each, as now I can’t add them back in. Fortunately I have full Outlook to fall back to, but I feel bad for those out there that don’t. Hi, can we add multiple yahoo yahoo mail accounts in Windows 10? I am used to accessing my several yahoo mail accounts in my iphone,I tried to add all my yahoo accounts in my new laptop with Windows 10,but only one yahoo account was successfully linked. Just tried to help a friend set up email on Windows 10 email. IMAP reported errors, but offered no indication of what, and would not work. So setting up instead to receive on POP, we managed to get it working – ONCE – thereafter neither of two accounts received messages. No access to the various settings that might have enabled the faults to be corrected. Looks as though you need to be a registry guru to get it working! Those settings will be in there somewhere.